The PokerListings Daily 3-Bet is a deep breath, a textbook crow pose and a quieted mind primed for afternoon poker news success. Got a hot tip for a future 3-Bet? Tell us where to find it in the comments below. Today in the 3-Bet we find Christian Pham on a straight flush bender, Chris Ferguson atop the POY standings and Fedor Holz fedoring unabated. Is Minnesotan Christian Pham the luckiest man in poker? Back in 2015 Pham infamously won his first WSOP bracelet in a 2-7 event which he mistakenly registered for thinking it was a standard $1,500 NL event. Having never played the game before, Pham went on to outlast an impossibly tough field to win $214k and a gold bracelet. Two years later he’s the chip leader with 27 players left in the Main Event – and had to hit a couple of near-impossible card sequences to do it. First: Pham earned his seat in the $10,000 Main Event via a $575 satellite. Then after bobbing and weaving his way to Day 5 Pham needed a river six (and only a six) to chop and survive. He hit it. Yesterday on Day 6 he rivered a straight flush to save him again and win a 20m-chip pot. Shortly after he hit yet another straight flush. We should all be so lucky just once in our poker lives. Congrats to him, though, as he’s clearly making the most of his good fortune. He’s locked up $263,532 already and will start with 31m chips when play begins today. Watch it all happen live starting at noon on ESPN and PokerGO! 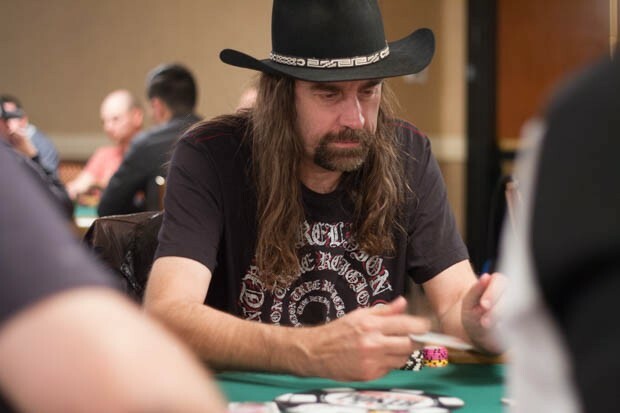 Much to the chagrin of many in the poker world, Chris “Jesus” Ferguson‘s 96th-place finish in the $1,111 Little One for One Drop over the weekend earned him enough WSOP Player of the Year points to finish the Las Vegas portion of the race in the #1 spot. Given his still-in-question role in the Full Tilt debacle and the ongoing debate over the fairness of the new King’s Casino sponsored POY formula, it doesn’t sit well with a lot of veteran poker pros – even if he did set a new record (along with John Racener) for WSOP cashes with 17. It’s also not a done deal yet. With the return of the WSOP Europe this October the 11 events on the schedule there will also count in the POY award rankings so there’s still lots of opportunity for Ferguson to be surpassed. Racener (currently 4th) for sure will be grinding hard in Rozvadov to re-take the lead and the likelihood Ferguson travels to play is low – although the player leading after Vegas does get a free buy to the €10,000 WSOPE Main Event. None of the 27 players left in the Main are in the current TOP 100 of the POY race. After a brief (but still successful) stint in Vegas at the beginning of June (back-to-back $50k wins at Aria for $750kish), Fedor Holz has done a lot of things. Worked full steam on his new Primed Mind app. Took a trip to Canada and Chicago with friends. Started a VLog. Even randomly ran into a poker legend on the streets of Banff. What he hasn’t been doing, to the dismay of poker fans worldwide? Playing any poker as he skipped the rest of the WSOP including the Main Event – an event he finished 25th in in 2015 no less. But even a “retired from poker” start-up entrepreneur can’t resist a good-value tourney, though. Fedor quietly dipped his toes back in the poker water over in Montenegro this weekend for a HKD $250,000 6-Max Event run by Paul Phua. As Fedor does – “Fedoring” should more or less be a verb for crushing poker tournaments by now – he’s currently in the final 3 with a shot at 3.4m HKD – or around $444k. And so it continues. As we’ve said before, there might be something to this Primed Mind thing. Update: He won. As if that’s a surprise.